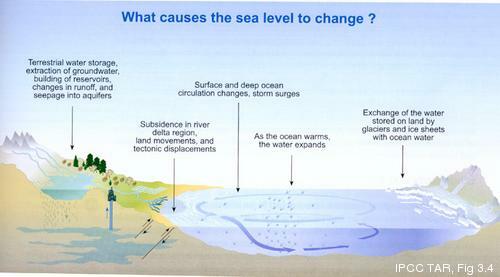 Sea level changes on a range of temporal and spatial-scales. The total volume of the ocean can change as a result of changes in ocean mass (addition of water to the ocean from the land) or expansion/contraction of the ocean water as it warms/cools. In addition, the ocean is NOT like a bathtub - that is, the level does not change uniformly as water is added or taken away. There can be large regions of ocean with decreasing sea level even when the overall Global Mean Sea Level (GMSL) is increasing. Obviously there must be regions of ocean with trends correspondingly greater than the mean to balance out the regions with trends less than the mean. There are many processes that drive these changes - we try to give a very brief introduction in these pages.